Fallout 76 Power Armor Edition Controversy Continues Bethesda's Woes | Nerd Much? It’s pretty evident that the Fallout 76 launch has been a bit rocky. With “a bit” being an understatement. Review scores have been abysmal. And now a PR nightmare has arisen with the now viral Fallout 76 Power Armor Edition controversy. For $200, many excited players purchased the Power Edition of the recently released online RPG. 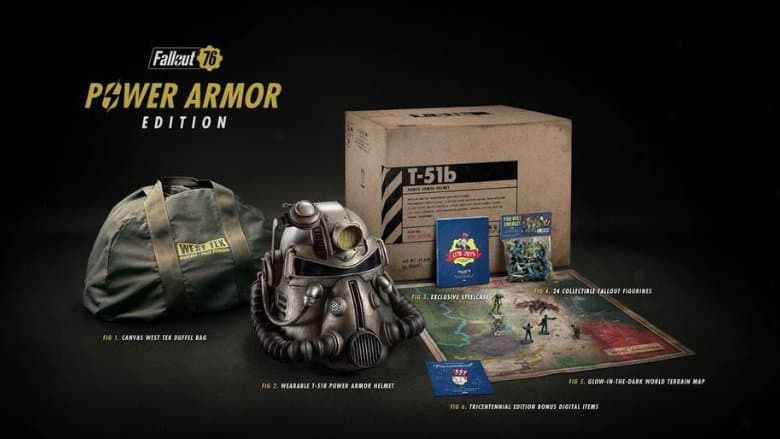 Within the Power Edition package was to come a wearable T-51b Power Armor Helmet, an exclusive steelcase, 24 collectible Fallout figurines, a glow-in-the-dark world terrain map, a few Tricentennial Edition bonus digital items, and a canvas Wes-Tek duffel bag. And that’s where the Fallout 76 Power Armor Edition controversy stems from. The Wes-Tek duffel bag is far from what was advertised. Instead of a duffel bag made of quality canvas, the Fallout 76 Power Armor Edition controversy comes due to the duffel bag being made of cheap nylon instead. On top of that, when players reached out to Bethesda to report their unhappiness of being deceived, their response was almost laughable. Many fans believe that a lack of materials in merely a scapegoat, and that Bethesda went with a cheaper material in order to save a substantial amount of cost. That’s, of course, purely speculation though. Regardless, this Fallout 76 Power Armor Edition controversy is just another piece in slew of bad press for Bethesda’s high profile release. Sitting currently at a Metascore of 55, it’s a long road uphill if this first online Fallout has any chance to survive this nuclear blast.